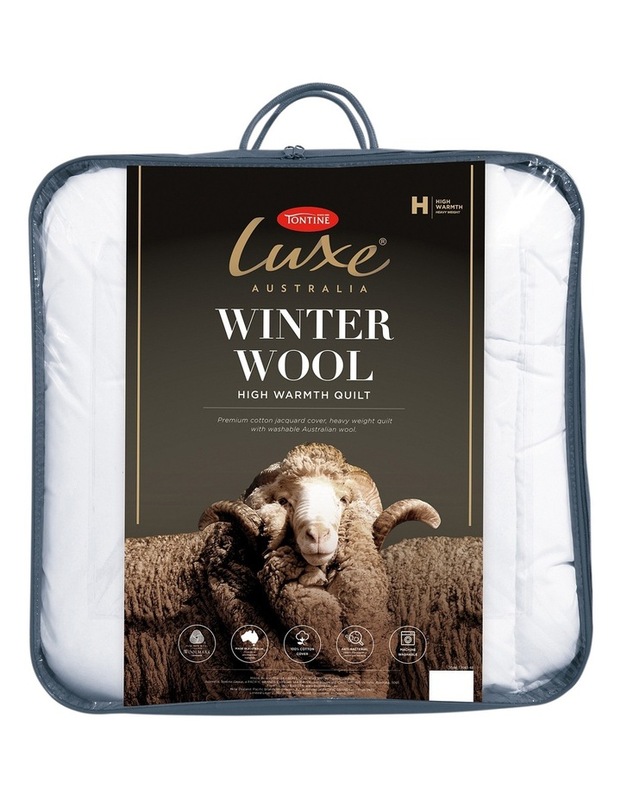 Tontine Luxe Washable Winter Wool Quilt is a beautiful and natural Doona featuring a premium wool filling and a soft natural cotton casing, perfect for those who love the natural properties and warmth of wool. Filled with premium Australian Washable Wool to provide High Warmth for the cold winter nights whilst being machine washable for easy care. Wool is a natural fibre that regulates body temperature while you sleep, keeping the sleeping environment warm and comfortable all night. Featuring a premium natural japara cotton cover, finished with a premium bound edge. Wool is a natural, breathable and temperature regulating fibre with a natural absorbency. Wool fillings are bouncy and provide medium level loft/height. Wool quilt covers are stitched to smooth any lumpiness and to minimise fill movement during sleep. The thickness and weight can vary across different quilts, however the general rule being, the heavier the gram per square meter (GSM) of fill in the quilt, the warmer the quilt will be. Warm machine wash - wool cycle. Do not bleach, soak or wring. Pull into shape while wet. Line dry over several lines without delay. Dry thoroughly before reuse or storage. Do not tumble dry. Do not iron. Dry cleanable (P). Excess washing may affect the comfort of the product. Use preferred wool detergent. Available in Single, Double, Queen & King sizes.